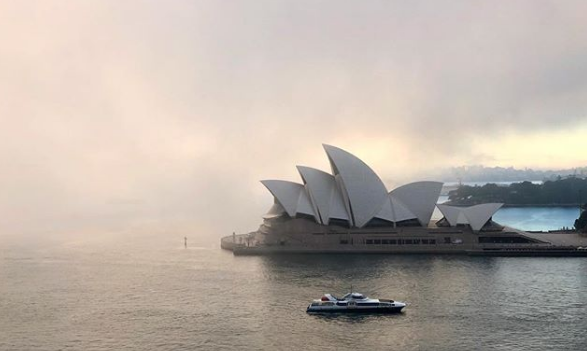 Sydney was blanketed in a thick fog this Thursday morning which covered all from Sydney Harbour to the downtown area. Social media filled up rapidly with pictures of the Opera House, Harbour Bridge and other well-known landmarks as they slowly disappeared from sight in a spectacular scene. As it was unable to make its way into the overseas terminal and wanted to give fair warning to other boats in the area, the large cruise ship continued to alert everyone in the area that it was moving. In the end, even the Sydney ferry services were cancelled. Just before 8 am, the low visibility even cause all domestic and international flights at Sydney Airport to be delayed whilst air traffic controllers waited for it to clear. Airservices Australia advised all arriving passengers to check with their airlines for any possible cancellation.